Game of Interest #1 Holy Cross Brown1110LaxWP Game PageHoly Cross had a night. Big win over Brown in 2OT. The Crusaders changed up their approach a bit in this one, prioritizing possession over aggressive offense, and it worked. Coming in, they had averaged 34.4 seconds/possession. In this one, they were at 54.7 seconds. On the year, they averaged .95 shots/possession. In this one, they were at 1.22. So while they were about at the average in terms of offensive efficiency, they had a 63% time-of-possession advantage. Holy Cross has won 60% of their faceoffs this year, so combining a strong x performance (65.4%) with an increase in possession length really hampered Brown. The Bears turned it over on 55% of their possessions and took a shot after just 16 seconds on average (compared to 27.1s on the year). Brown always plays fast, but in this one, they were forced to speed up even more and it hurt them. Tension Game Score: 69★ ★The tension game score for this game was 69, which indicates an fairly close battle.Holy Cross Min. Win Probability: 16%★ ★The lowest win probability that Holy Cross had at any point during the game was 16%, which suggests that you would not fault those that switched over to something more compelling.Lax-ELO Points Transfer: 19★The victory means a transfer of 19 Lax-ELO points from Brown to Holy Cross. As a result of this transfer (and the rest of the games played), Holy Cross moves from 59th to 58th nationally; Brown goes from 30th to 34th. 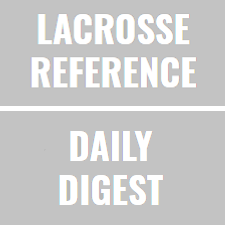 Game of Interest #2 Harvard Boston U1211LaxWP Game Page1% is the number you need to know. That is the raw win probability that Harvard faced down 9-4 to BU in the 3rd quarter. The comeback started then, but hit a snag when Chris Gray sent the game to overtime with a buzzer beater to tie things 11 all. I need a new stat to describe games in which both teams face a 1% win probability and the game still ends up in OT. That it was we had here. Just a great game in Boston. Gray was the top player by EGA, but Harvard got a more balanced contribution across the board. Cuccurullo finished with 3.91 EGA, but Hamm was right on his tail. The model may have ranked this the #2 game of the day, but it’s #1 in our hearts. Tension Game Score: 117★The tension game score for this game was 117, which means that it was not a very tight affair for the most part.Harvard Min. Win Probability: 1%★ ★ ★The lowest win probability that Harvard had at any point during the game was 1%, which means that this was a “happens-a-couple-times-a-year” type comeback.Lax-ELO Points Transfer: 18★The victory means a transfer of 18 Lax-ELO points from Boston U to Harvard. As a result of this transfer (and the rest of the games played), Harvard moves from 43rd to 38th nationally; Boston U goes from 13th to 16th. Game of Interest #3 Fairfield NJIT185LaxWP Game PageTension Game Score: 153★The tension game score for this game was 153, which means that it was not a very tight affair for the most part.Fairfield Min. Win Probability: 63%★The lowest win probability that Fairfield had at any point during the game was 63%, which tells us that the eventual victory was never really in doubt.Lax-ELO Points Transfer: 61★ ★ ★The victory means a transfer of 61 Lax-ELO points from NJIT to Fairfield. As a result of this transfer (and the rest of the games played), Fairfield moves from 64th to 59th nationally; NJIT goes from 72nd to 72nd.